Do you want to hunt for gold nuggets? If so, it’s vital to get a metal detector that can handle tough ground conditions. In this article, I’ve listed eight of the best metal detectors for gold to help you make the right choice for your budget and experience. 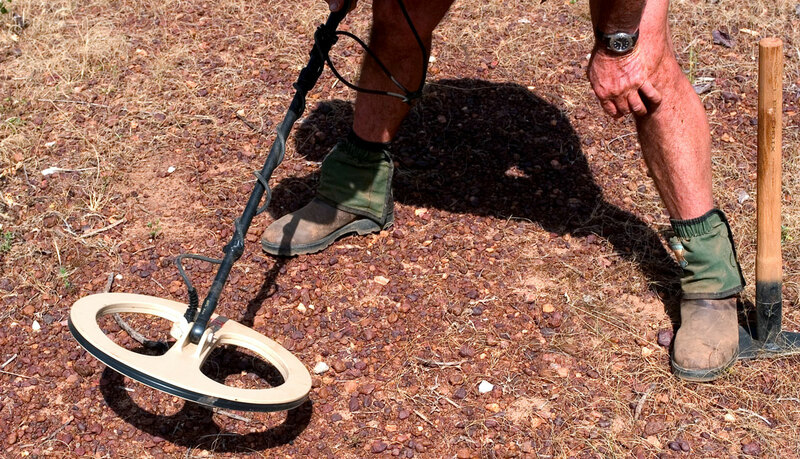 Gold prospecting with a metal detector is a popular hobby – and it’s easy to see why. Aside from being potentially lucrative, gold hunting is a lot of fun. In fact, many people with the "bug" for prospecting find it consumes most of their free time! Unlike searching for coins or relics, however, getting the right detector is essential if you want to hunt for gold. Most detectors can’t handle the tough environments where gold is located, so it’s important to carefully consider which model to buy. What should you look for in a gold detector though? And how can you choose with so many (expensive) models on the market? Know Your Budget – Gold metal detectors can be expensive, especially if you need a pulse induction model (more on that in a moment). That doesn’t mean you need to spend $8000 on a high-end Minelab though – and in some environments a cheaper model may be nearly as effective. To help with this, I’ve categorized my top models by price range. Choose High-Frequency VLF or Pulse Induction Technology – Both types of metal detector have their advantages and disadvantages, so the right choice depends on your requirements. Avoid low frequency VLF machines though (<15kHz), as they don’t have the sensitivity required to find small gold nuggets. Check the Detector Can Handle High Mineralization – Gold is often found in soil containing high levels of mineralization, which can cause lots of chatter when using regular detectors. A gold detector should either be able to filter this out or ignore it completely. Get a Detector With Manual Ground Balance – Having the ability to manually adjust the ground balance of your machine is important when hunting in tough locations. Research Your Hunting Location and Goals – The best gold metal detector for YOU depends on where you’re prospecting. The mineralization, amount of trash, depth and size of the average nugget all affect the right choice. Keep this mind when reading the mini reviews below. With those factors in mind, here’s my list of the best metal detectors for gold. What About Deep Seeking or Two Box Detectors? How Deep Can Gold Be Detected? Where Are Gold Detectors for Sale? If this is your first gold metal detector, I recommend choosing an entry-level model that balances price and detection ability. These models may not have the advanced features found on some of the detectors further down this list, but that doesn’t mean they can’t do a great job in the right environments. How much should you expect to pay for an entry level detector though? While you can find some excellent “regular” metal detectors for around $250-$300, you’ll need to spend at least $500 for an entry-level gold detector. Anything less is likely to be ineffective in the tough environments where gold is usually found. 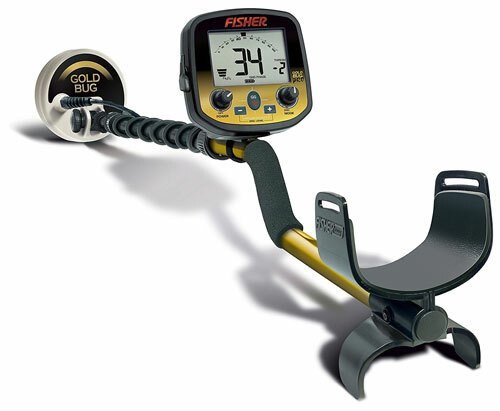 One of the best entry-level gold metal detectors is the Fisher Gold Bug Pro. With a list price of $699.99, it’s one of the cheapest gold detectors – yet can still do a great job of finding small gold nuggets. At its core, the Gold Bug Pro is a VLF detector with a 19kHz operating frequency. It comes with a 5” round search coil, along with 2-tone audio identification and an LCD screen. The detector is also lightweight at just 2.5lbs. Despite its reasonably low price, the Gold Bug Pro has a number of important features for gold prospecting. These include both manual and automatic ground balance (with continuous ground readouts), “All Metal” and discrimination hunting modes, target ID, and a Fe3O4 graphic indicating the level of mineralization. One of the great things about this model is how easy it is to use. If you’re just getting started with gold hunting, or prefer simple models, you’ll quickly feel comfortable using it. What type of environments is the Gold Bug Pro designed for though? With a low operating frequency for a gold detector, the Gold Bug Pro provides reasonable depth while doing a great job of handling hot ground and trash. It’s never going to rival a pulse induction detector for depth, but it’s great for finding smaller nuggets without spending a fortune. Its sensitivity is helped by the small 5” DD searchcoil. This is also waterproof, although you may want to consider the optional larger search coil for maximizing depth. In summary, the Gold Bug Pro provides excellent value for money. It does a decent job of handling mineralization and is great for identifying targets. If you’re planning to hunt in areas with plenty of iron trash, the target IDs can also help you ignore targets you don’t want to dig. Note: The Gold Bug Pro is the updated version of the previous Gold Bug. The most important addition is manual ground balance. Another excellent entry-level gold detector is the Garrett AT Gold. It’s fully waterproof, unlike the Gold Bug Pro, so it can be used on both dry land and in water. The AT Pro also has a number of advanced features, including Garrett’s “Pro” audio mode, iron audio, manual ground balance and digital target ID. The AT Gold is an entry-level gold detector, but it isn’t as straightforward to use as the Gold Bug Pro. Instead, Garrett has crammed in a host of features and adjustments, so be prepared to spend some time learning how to use it. A good example is the high-resolution iron discrimination. The AT Pro provides over 40 iron resolution points, which is great for separating trash from real targets. It can take some time to use this feature effectively when you’re first getting started though. The “Pro” audio mode is also brilliant for getting more information without looking at the screen, but you’ll need to learn what the noises mean and how they correspond to the detected target. This doesn’t mean the AT Gold isn’t well-designed though. Once you’ve learned the various features and settings, it’s a joy to use – especially with the clear Target ID and depth indicator. The AT Gold also provides great sensitivity for small gold nuggets. It’s a VLF detector, so don’t expect the depth of a pulse induction model, but it’s brilliant for smaller nuggets that are near the surface. So, who should choose the AT Gold over the Gold Bug Pro? For fresh water gold prospecting in rivers, creeks and lakes, the AT Gold is the obvious choice. It’s waterproof down to depths of 10-feet, so you don't need to worry about getting the control unit wet. The AT Gold isn’t designed for saltwater conditions though. It has a relatively high frequency, which makes it more sensitive and hence not suitable for sand soaked with salt water. If you don’t have any interest in underwater gold prospecting, the Gold Bug Pro is my top pick due to its ease-of-use and suitability for beginners. The Garrett has more advanced features though, so I don't think you'll be disappointed with either model. If you want greater sensitivity from a gold metal detector, but can’t afford the high-end models on this list, the following mid-range models could be the ideal solution. All three detectors cost less than $1000, but are sensitive to small gold flakes and can handle high levels of mineralization. You might notice a pattern with the mid-level detectors on this list: they are all relatively old machines. There’s a good reason for this! These models are proven to work in the challenging environments where gold is found, are highly durable and provide all the features you need to hunt for gold. While newer models in the “mid-range” price bracket add some useful extras, they almost never improve on the excellent sensitivity of these classic machines. One of the most famous gold detectors is the Fisher Gold Bug 2 – and for good reason. This is a fantastic detector that provides great value for money. It might not appear as advanced as some of the other models on this list, but for finding small gold nuggets it’s hard to beat in this price range. The first thing that jumps out about the Gold Bug 2 is the high 71kHz operating frequency. This provides outstanding sensitivity for small gold nuggets located near the surface. In fact, it’s arguably the best detector on the market for finding tiny gold flakes. It’s also a relatively lightweight and slim detector. At less than 3 pounds, you won’t get tired from swinging it for long periods. It’s also simple to use, although you’ll need to practice using the “IRON DISC” mode and dual-knob ground controls (fine and coarse) to get the best results. Even though the Gold Bug 2 is one of my favorite detectors, it’s not the right choice for all situations. As with all the VLF detectors on this list, the Gold Bug 2 isn’t effective at searching for deeper targets. For that, you’ll probably want to buy a pulse induction detector – especially for areas with heavy mineralization (although the GB2 has 3 settings for mineralization). There’s also no digital display, so you’ll need to learn how to use the audio identification properly. Despite these drawbacks, the Fisher Gold Bug 2 is one of the best VLF gold detectors on the market. It doesn’t have the advanced features or digital screen found on other models, but for detecting tiny gold nuggets in shallow depths it’s an excellent choice. Another excellent high-frequency VLF detector is the White’s Goldmaster GMT. With an operating frequency of 48kHz and a 6” x 9” search coil, it’s capable of finding small nuggets of gold while handling high levels of ground mineralization. 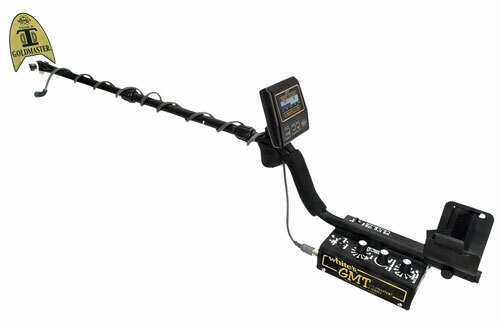 As you would expect from a gold detector, the GMT has both manual and automatic ground balance modes. There’s also an iron target analyzer to make identifying false targets easier, along with a “Follow the Paystreak” display which shows the levels of magnetic minerals. While the GMT has a digital display, it’s very basic, so don’t expect the advanced features found on more expensive models. It’s useful to have a visual display of the iron ID though. The upside of the simple control panel is that it’s easy to use, as the only information provided is the ground balance and amount of mineralization. There are also settings for ground balance mode, gain, audio threshold and S.A.T speed. A bonus is that the battery holder can hold up to eight AA batteries. This provides up to 40 hours of hunting time from one set of batteries, although the run-time is reduced if you want to use rechargeable cells. So, should you buy the Goldmaster GMT or Fisher Gold Bug 2? Both are excellent models that excel at finding small nuggets. The White’s model provides marginally greater depth than the Fisher – although neither are designed for hunting large targets deep below the surface. 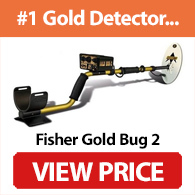 My preference is the Fisher Gold Bug 2, as it can find nuggets that other detectors may miss. There’s no doubt the Goldmaster GMT provides excellent value though. The Lobo SuperTRAQ has been around for a while, but it’s still one of the best metal detectors for gold in the mid-range price bracket. Like most Tesoro models, it features an analogue control panel and lacks the bells and whistles found on newer detectors – but don’t let that put you off. It’s a VLF detector with a 17.8kHz operating frequency. This is much lower than the 71kHz frequency of the Gold Bug 2, so it’s not as sensitive to small golden nuggets. The upside is that it provides greater depth than ultra-high frequency models, although it can’t match pulse induction models in this regard. Aside from its operating frequency, the SuperTRAQ features advanced ground tracking system and discrimination to help you search in tough ground conditions. There’s also sensitivity control, adjustable threshold and three ground tracking modes – plus it provides clear and crisp audio signals. Is it better than the Gold Bug 2 though? In short, no. It’s less sensitive than the GB2, so it won’t find the tiny flakes the Fisher model is famous for detecting. It also has fewer features and lacks manual ground balance. It’s still deserving of a place on this list, as it’s a highly capable gold detector that’s available for a reasonable price. I can’t recommend it over the Fisher Gold Bug 2 or White’s Goldmaster GMT though. For those who are serious about gold prospecting, high-end detectors provide outstanding performance and depth. They aren’t cheap – expect to pay $2000 or more – but can find gold nuggets that cheaper models can’t. 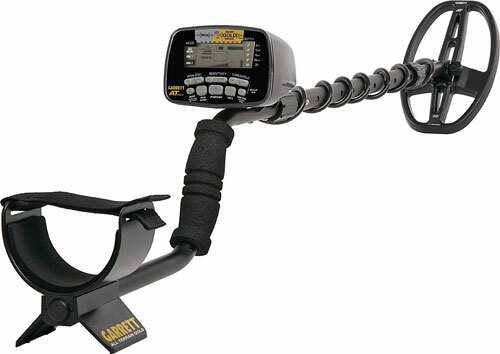 The heavyweight champion of gold metal detectors is the Minelab GPZ 7000. It’s an expensive detector (putting it mildly) - but has advanced features you simply can’t find on any other model. Let’s start with the circuitry. 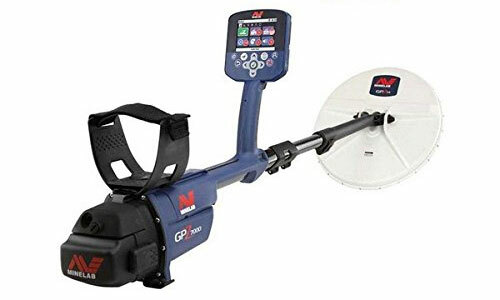 Unlike the other models on this list, which are either pulse induction or high frequency VLF, the GPZ is built with Minelab’s Zero Voltage Transmission (ZVT) technology. With standard metal detectors, there’s always a trade-off between sensitivity and depth. Higher sensitivity increases interference which reduces depth, while greater depth decreases sensitivity to smaller objects. With ZVT technology this tradeoff is minimized, which allows the detector to provide both increased sensitivity and impressive depth. The result is that the 7000 is fantastic at detecting both deep nuggets and smaller flakes. Even if other detectorists have hunted the same locations, the GPZ 7000 is likely to pick up nuggets that every other detector has missed. In other words, to get close to the detection ability of the 7000, you would need both a high-frequency VLF and PI detector. To put the depth into perspective, Minelab claims the GPZ 7000 can detect gold up to 40% deeper than the GPX 5000 when hunting both small and large nuggets. Considering the GPX 5000 already provides great depth, this is astonishing. As you would expect, the GPZ 7000 also does a great job of detecting in tough ground conditions with heavy mineralization. There are both automatic and manual ground balance settings, along with a variety of adjustments. Aside from the detector technology, Minelab has put a lot of thought into how the 7000 handles. There’s a detachable swing arm for greater control, which is particularly important as the coil is quite heavy. The menu is also designed to be simple to navigate despite the wide range of objects. A potential drawback is the complexity of the machine. The screen contains a number of advanced features and settings, which can be overwhelming at first. You'll also need to spend time learning which mode combinations (Gold Mode and Ground Type) provide the best results. When you add features such as the built-in GPS and logging software, there’s a lot to learn! To summarize, the Minelab GPZ 7000 is expensive, heavy and takes time to learn – but those are all minor issues once you realize the power of this detector. It’s a next-generation model that’s the best option for anyone who is serious about gold detecting and has the budget to afford it. That's why it's my pick for the best metal detector for gold. If your budget can’t stretch to the GPZ 7000, the GPX 5000 is a less expensive alternative that’s almost certainly the “second best” gold detector on the market. What makes the GPX 5000 so effective though? The 5000 is a pulse induction detector designed specifically for hunting gold. It features many of Minelab’s exclusive technologies, such as Dual Voltage Technology (DVT), Smart Electronic Timing Alignment (SETA) and Multi Period Sensing. Most importantly, it’s extremely sensitive to gold and can easily pickup both small and large nuggets. The 5000 also provides great depth, so you can find nuggets that would be missed by most machines. Eight timing settings are included with the GPX 5000, such as Normal, Enhance, Sharp and Fine Gold. One of the newer options is Salt/Gold timing, which makes the model a great choice for hunting for gold at the beach. There are also six preset search modes. Away from the circuitry, the 5000 is an attractive machine that’s lighter than the 7000, so it’s slightly easier to use for long periods. There’s also a digital display with LCD backlight, 15 “ x 12 “ elliptical search coil and various accessories. I mentioned this is the “second best” gold detector on the market, as the 5000 can’t match the performance and features of the GPX 7000. It doesn’t include ZVT technology, for example, and is also less intuitive to use. Extra features, such as built-in GPS, are also not included. 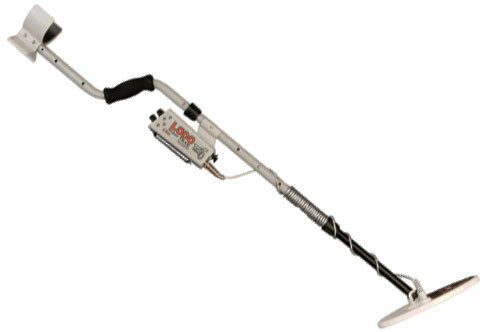 Even so, the GPX 5000 is a brilliant gold metal detector that provides professional-quality performance. It’s not perfect and it takes some practice to learn how to use, but serious gold hunters will love its performance and potential to find gold nuggets other machines can’t detect. So far, all the models on this list have either been high-frequency VLF or pulse induction devices. The XP DEUS breaks this pattern, as it’s a multi-frequency detector with a variety of pre-set programs. This makes it suitable for a wide range of applications – including gold hunting. The XP DEUS allows you to adjust the operating frequency depending on the situation. There are four options – 5kHz, 8kHz, 12kHz and 18kHZ – but the 18kHz is probably what you’ll use when hunting for gold. There are also a number of pre-set programs. Most importantly for this article, the GOLD FIELD program changes the detection method to counteract high levels of mineralization. This program runs the detector in all-metal mode, so it can find small targets while ignoring heavily mineralized soil. It’s not the easiest program to use, and requires some tweaking to get right, but does a great job of finding gold nuggets. Aside from its pre-set programs, the DEUS provides a range of adjustment options, including both automatic and manual ground balance. It has rapid recovery and provides excellent depth, so you can locate targets that are close together. There’s also a pinpointer mode, LCD display, fully wireless design and target ID. One of the best things about the DEUS is that it has a faster processor than many detectors. This allows it to recognize non-ferrous targets even in areas that are packed with junk, which most detectors struggle with. The advanced discrimination can even allow you to find gold underneath iron junk, which is a common problem and something many detectors are unable to achieve. While the DEUS does a great job of prospecting, it isn't as effective as the two Minelab models. Those models are designed specifically for gold hunting though – they aren’t great for other types of metal detecting. In contrast, versatility is where the DEUS excels. So, if you’re looking for a versatile detector that can be used for gold prospecting, coin shooting, relic hunting and even beach hunting, then the DEUS can handle almost anything you can throw at it. I highly recommend it. Note: Aside from being close to the best metal detector for gold prospecting, the DEUS is also #1 on my list of the best all-round metal detectors. You can view the full list here - https://huntingformetal.com. While the models above are all excellent for gold hunting, it’s important to understand the various features and accessories available. This helps you choose the right model for your environment, budget and goals. But before we go any further, let’s clear something up. There’s a common misconception that only certain types of metal detector can find gold. This simply isn’t true. Gold is just another type of metal, so all detectors can find it…in the right conditions. So, why can’t you use any detector rather than paying extra for one that’s designed for gold? The reason is that gold is often harder to detect than the average coin or relic. To start with, gold nuggets are nearly always small, which makes detecting them difficult. You’ll mostly be searching for nuggets that weigh less than one gram, rather than relatively large coins. Most gold is also found in highly mineralized soil. Low-frequency VLF detectors struggle with these conditions, as the mineralization and high iron content causes heavy interference. Without equipment that’s designed to handle these difficulties, you won’t be able to consistently find gold nuggets and flakes. The average metal detector just isn’t up to the job. So, with that in mind, let’s take a closer look at the features required when buying a gold metal detector. There are two types of detector commonly used for gold prospecting: high-frequency VLF and pulse induction. Both have their advantages and disadvantages, so there’s not a “best” option for all purposes. Here’s a brief overview of each type. Very Low Frequency (VLF) detectors designed to find gold have a higher operating frequency than those for coins ore relics. While the average VLF detector might have a frequency of 5-15kHz, those designed for gold are usually in the 15-75kHz range. Why the difference in frequency? The higher the frequency, the better a VLF detector is at finding small nuggets of gold. This comes at the cost of depth though, as lower frequency detectors “see” deeper into the ground. An advantage of a VLF machine is electronic discrimination. This allows you to filter common junk items, such as those made form steel and iron. VLF detectors are also cheaper than pulse induction models. A downside is that VLF detectors are more sensitive to mineralization, which can cause frequent false signals. The best metal detectors for gold are excellent at filtering out interference from mineralization, but they are not perfect. Pulse induction metal detectors are often more expensive, but they are better at ignoring mineralization. This makes them a great choice for locations with tough ground mineral conditions. Pulse induction machines can also locate larger gold nuggets that are buried deeper. There are some drawbacks to PI metal detectors though. Aside from the price, pulse induction detectors cannot discriminate junk items. They are also less effective at finding smaller nuggets compared to high-frequency VLF machines. I wish I could tell you that either high-frequency VLF or pulse induction detectors were “best” in all scenarios, but this would be doing you a disservice. The truth is that there is no right option for all environments. Instead, you need to choose the best option for your requirements. For hunting areas with relatively low mineralization, you’ll be able to find smaller nuggets with greater consistency when using a high-frequency VLF detector. Of course, if you’re looking for larger nuggets that are buried deeply in the ground, a lower frequency might be better. On the other hand, if you’re hunting in ground with high levels of mineralization, a pulse induction machine is likely to perform better. These models excel at ignoring mineralization and focusing on real targets. While you can still use a VLF detector, you’ll need to deal with many more false signals. It’s also important to consider how much trash is in your target area. If there’s lots of trash, a VLF detector is probably the better choice as they can discriminate unwanted signals. PI detectors aren’t good at this. Choose a high-frequency VLF detector if you can’t afford a PI model, want more versatility from your detector, are going to be hunting in “trashy” areas or are focusing on small nuggets at a relatively shallow depth. Choose a pulse induction detector if you’re going to be hunting in highly mineralized areas, won’t need to deal with much trash, have a larger budget, and only plan to use the detector for gold hunting. And if that still doesn’t make sense, feel free to ask me about anything you don’t understand by using the comments form below. There’s no doubt about it: gold metal detectors can be expensive. 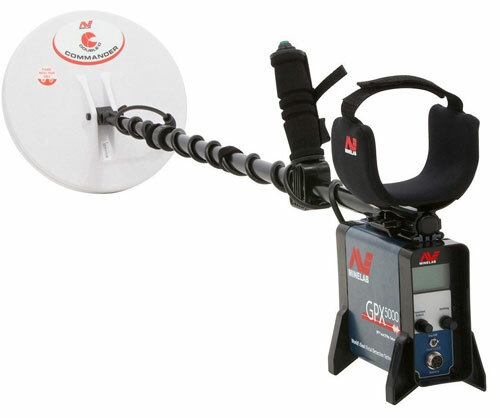 The best models (such as the Minelab GPZ 7000) have a list price of over $10,000. This reflects the cutting edge technology and detection performance of these machines, but it’s a huge amount of money. Even if you don’t need the very best detectors, it’s common for pulse induction models to cost thousands of dollars. That’s why it’s important to know how much you want to spend, as it has a big effect on which detectors you should even consider. While the best pulse induction models are outside many people’s budgets, high-frequency VLF detectors are often considerably cheaper. If you’re on a tight budget, it’s probably best to stay away from PI detectors unless they are absolutely necessary for your hunting environment (a good example is if the ground is highly mineralized). If you have a large budget and just want the best performance, there’s no doubt that expensive models like the Minelab GPZ 7000 are amongst the best on the market. That still doesn’t mean they are the right choice for every situation though – remember to keep in mind the amount of trash, mineralization and nugget type in your hunting locations. It’s easy to get overwhelmed when you start looking at the feature lists of gold metal detectors. As with any tech-based industry, manufacturers love to boast about cutting-edge features or exciting new technology. While new features may help you hunt for gold more effectively, the most important are always going to be ground balance, discrimination, ability to handle mineralization (which we’ve discussed already) and operating frequency. Here’s an overview of each. Nearly all modern gold detectors have automatic ground balance. Some, however, don’t have manual ground balance. While automatic is fine for coin or relic hunting, a lack of a manual mode is a problem when looking for gold. This is because high levels of mineralization often require you to adjust the balance to filter iron content. I recommend choosing a detector with both automatic and manual ground balance modes. Detectors with automatic ground tracking don’t require as much adjustment, but it’s useful to have the option of manual adjustment when it’s required. This might sound intimidating if you’ve never used manual ground balance before. I can assure you that it quickly becomes natural though – and you’ll wonder how you managed without it. As I mentioned earlier, there’s nothing “special” about gold metal detectors. While they are designed to maximize the chance of detecting gold, they will still find all types of metal along with gold nuggets – including trash. That’s why discrimination is an important feature. VLF detectors are often able to ignore common junk items, such as those made from iron and steel. In environments with lots of trash, this can save lots of time digging up useless targets. Pulse induction metal detectors are not designed to discriminate though. While they are excellent at ignoring trace metals in highly mineralized soil, they can’t discriminate trash items. This is why high-frequency VLF detectors are better suited to environments with lots of trash items. Higher frequencies allow a detector to discover smaller gold nuggets, but at the cost of depth. Lower frequency detectors provide more depth for finding larger nuggets - but may miss smaller targets. The right option depends on where you want to hunt. If most of the finds in your hunting environment have been small nuggets at shallow depths, look for a higher frequency detector. It’s better to dig too many targets than to miss them all. If you’re searching for larger nuggets that are buried deeper, however, then a lower frequency detector may be more effective. Local detector clubs are often great sources of information about previous finds. Ask about the size and depth of nuggets found in the past so you can make an informed decision. Just like operating frequency, the size of the search coil affects the size of targets that are likely to be detected. A smaller search coil provides better sensitivity for smaller targets. They are also more effective at separating multiple small objects in areas with lots of trash. Larger coils, on the other hand, are able to search deeper into the ground and can cover areas more quickly. This comes at the cost of reduced sensitivity for small targets though. Larger coils may also struggle more with highly mineralized ground. Concentric – Concentric coils are great for discriminating, so they are often used in environments with lots of trash. Widescan – Widescan searchcoils don’t provide the same level of discrimination, but are better for ignoring the effects of ground mineralization. As with almost every feature in this section, the best type of coil depends on your local environment. Fortunately, the internet provides plenty of information about gold producing regions. The detectors on this page are designed to find nuggets of gold that occur naturally in certain environments. They do a great job of this, but the depth of detection is limited by the small size of most gold nuggets. What if you want to locate boxes of hidden treasure though? These caches are usually buried deeper than the average metal detector can penetrate. In this case, you’ll need a deep seeking and two box metal detector. These models are terrible at detecting small nuggets, but are great for finding large amounts of gold, silver, and other precious items that are buried underground. Gold prospecting requires extra tools and accessories compared to regular metal detecting. Aside from standard items such as a pinpointer, gloves, headphones and coil covers, you’ll also need a scoop and a magnet to identify iron trash. It’s also a good idea to bring a pick if you’re going to be hunting in rocky environments. This depends on the detector, environment and size of the gold nugget. As a general rule, a nugget that’s half the size of a grain can be detected at a depth of up to two inches by the best gold detectors. As the size gets larger, the depth also increases. A gold nugget the size of a match head, for example, could be located at depths of up to 5 inches. Bigger nuggets can potentially be detected at depths of over a foot if you’re using a pulse induction system. Avoid buying a gold detector from Walmart or similar stores though – unless it’s a recommended model. There’s also the option of buying a used or second-hand gold metal detector. While this can be a great way to save money, make sure you’re fully aware of the condition of the machine before you buy. On a side note, you can also rent gold metal detectors. This is a great way to find out whether a detector meets your requirements. This is a long post, so you might want to read it a few times to make sure you understand everything! While hunting for gold isn’t difficult, it requires specialist tools if you want to be successful. 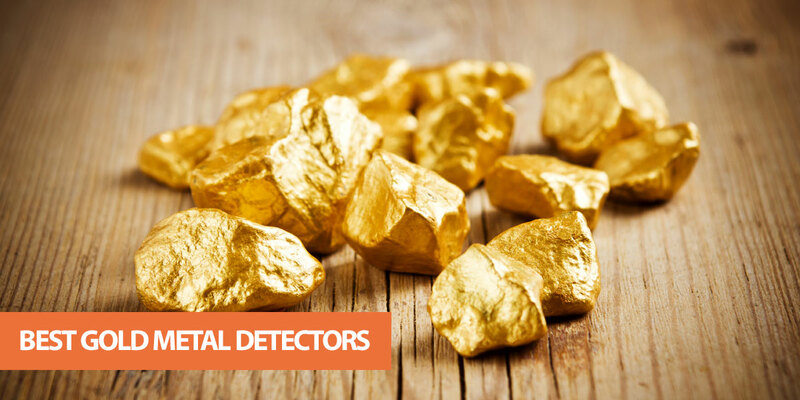 You also need to understand what makes the best gold detector for your requirements. The key is to know whether your hunting ground is likely to contain small and shallow nuggets, or large and deep nuggets. Then choose the detector that is likely to perform best in this environment that’s also within your budget. Of course, the ideal setup would allow you to find both shallow and deep gold nuggets. Buy the Minelab GPZ 7000 which provides the best of both worlds – but be prepared to spend close $10,000 or more depending on its current price. 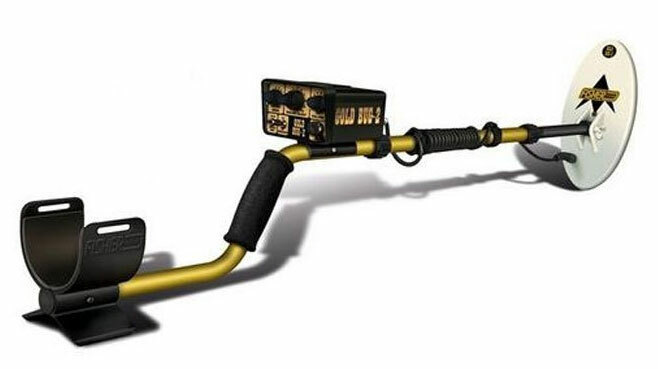 If you want the best metal detector for gold hunting, however, this is the #1 option. Buy both a high-frequency VLF detector and a pulse induction model. This allows you to hunt for a wider range of nuggets for a lower cost. Option two might sound like overkill, but it’s cheaper than buying the GPZ 7000 and allows you to hunt for a greater variety of nuggets. You probably won’t need to buy two detectors as a beginner, but as you get more serious it’s an option to consider. I hope this article has helped you choose the best gold metal detector for your budget and requirements. If you have any questions, please use the form below – I do my best to respond to every comment.